On May 14th, 2004, teams from UC Berkeley, JPL, Scripps, NASA-Ames and the Netherlands gathered in Panoche Valley, CA for a complete sample-to-result field test of the MOD-MOA instrument. 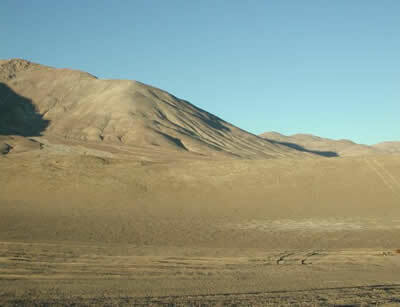 Panoche Valley in central California was chosen for its high abundance of a sulfate-rich mineral called jarosite. This mineral is only found in locations where water once existed, and it has recently been detected on Mars by the rover Opportunity, indicating that Mars was once wet (see Science article by Kerr). The goal was to establish whether amino acids and amines could be isolated from jarosite and analyzed by our system. Jarosite samples were ground and deposited into MOD, sublimed onto the coldfinger coated with fluorescamine, and them MOA sipped samples from that surface to analyze. Several amino acids were successfully identified and quantified, and the results were further confirmed by later studies in the laboratory. This was the first time MOD and MOA had shared a bench, and the result was a very successful filed test by all accounts. The results of the field test, along with the characterization of the MOA, have been published in PNAS. A brief summary of the results can be found below. Over the two day field test, jarosite samples were collected, ground for analysis, sublimed by MOD and then analyzed by MOA by sipping off the cold finger. Both pure jarosite and a jarosite scraping were run, as well as a blank. The results of the pure jarosite vein are shown below. Analysis of a jarosite sample from the Panoche Valley, CA with the MOA instrument in the field. Samples were prepared by sublimation from solid sample powder using the MOD sublimation device followed by analysis with the MOA using a 2 second direct injection. Several amino acids and amines were detected, including aspartic (0.13 ppb) and glutamic acid (0.07 ppb), glycine (0.2 ppb), alanine/serine (0.4 ppb), valine (~ 100 ppb) and methyl and ethylamine (~ 5 ppb). The amino acids were identified by spiking with a standard mixture of amino acids. The jarosite scraping was also analyzed, and it showed similar concentrations. A blank, taken through the complete sublimation to CE analysis procedure, showed considerably lower levels of all amines and amino acids. Samples collected during the field test were further analyzed in the lab. The samples were confirmed to be jarosite by X-ray crystallography. 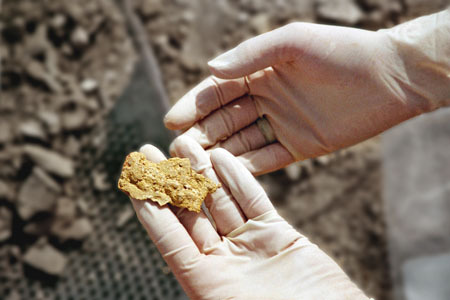 Jarosite samples were acid-hydrolyzed and extracted from the soil matrix using a cation exchange column. The aqueous extracts were run on both HPLC and on the MOA. Lower concentrations of amino acids were detected during the field test, most likely due to some decomposition of amino acids to amines during sublimation. Higher concentrations (sub ppm) were detected by both HPLC and the MOA in the laboratory, and the amino acids detected confirmed the identifications made in the field. The field testing of the MOD-MOA system successfully demonstrated amino acid analysis from a representative soil sample, and the analysis of jarosite extracts in the laboratory demonstrates the accuracy and sensitivity of the MOA relative to HPLC. Most importantly, these results clearly indicate that amino acids can be extracted from acid and sulfate-rich soils such as jarosite. Jarosite, a sulfate-rich mineral, is formed by precipitation from water. This mineral has recently been detected on Mars. Graduate student Alison Skelley operating the MOA inside the RV at the field test site. Team photo at the Panoche Valley, CA site, May 14, 2004. 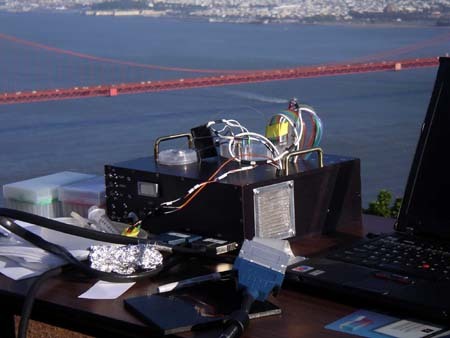 The Micro CE device was tested in the Marin Headlands on March 4th , 2004. The purpose of the field test was to first demonstrate that the device would work in the field, from sipping a sample to performing CE analysis, and second to complete an end-to-end field analysis of soil samples prepared in Chile. These samples were sublimed by MOD during the Atacama field test. Analysis was completed in the Headlands by pumping buffer onto the disk and then directing sample to the separation channel. Chile, for field campaigns. The curves summarize (i) the biological activity of the regions in colony forming units (CFU) per gram, (ii) the concentrations of organics benze and oxybismethane and (iii) the mean precipitation (mm) and temperature (°C). The extreme conditions of the Atacama at these latitudes create a unique Mars analog environment. 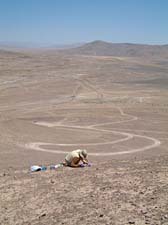 From Feb 14th to 22nd , Alison Skelley, Frank Grunthaner and a team from JPL/Nasa-Ames performed field tests in the Atacama Desert, Chile. MOD was shipped from JPL and set up at the desert research station (Yunguy Station). The first few days were spent setting up the laboratory space and assembling equipment. 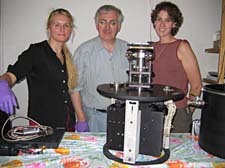 Once the equipment was assembled and aligned, soil samples were collected from various sites and sublimation samples were prepared by MOD for analysis at JPL and Berkeley. caps. The Martian polar caps are composed primarily of frozen carbon dioxide, but in the summer this upper cap sublimes to reveal an ice cap below. The ice cap may contain evidence of extinct or extant life, so performing field tests in Antarctica or Greenland would simulate a polar mission. The Mojave Desert in central California is the closest and most accessible field research site for testing both scientific and robotic equipment intended for Mars. The low levels of rainfall create a "mars-like" environment, and the low levels of life make the site a good location for testing our instrument's ability to detect signs of life outside of the laboratory environment.